Nature’s Packaging is an initiative which has been launched to promote the environmental benefits of wood pallets and packaging over other materials. Launched in March of this year, the scheme has been designed to show that wood is a highly renewable and sustainable resource. The environmentally friendly initiative came about when the Canadian Wood Pallet & Container Association, the National Wooden Pallet and Container Association and the Western Pallet Association all put their heads together, with help from the Pallet Foundation, and found an effective way to define the material’s sustainability in black and white. The humble wooden pallet has a lot more to offer than people might think. Other than the obvious storage and transportation uses, pallets can have a fascinating after-life – sometimes being reused for commercial purposes but also by hobbyists to create a range of structures, furniture or 3D art. This process of upcycling is a nice way to pay homage to the wood pallet as it celebrates what can become of the ordinarily simple wooden structure. Not only is wood recycling and upcycling an economically friendly process, but it is a very responsible approach to saving our environment taken by professionals and hobbyists alike, as it reduces the amount of carbon emissions from landfills and the effect they have on our precious planet. Nature’s Packaging’s main aim is to highlight the environmental benefits of waste wood like pallets and packaging. In order to show just how sustainable a resource it is, the initiative has launched a Wood Waste Calculator. This tool indicates how many metric tons of CO2 emissions per month have been saved, based upon the weight of the wood in pounds or the number of pallets reused. The client-based data illustrates in relatable terms how renewable reused wooden pallets are and by how much this act has contributed to making the world safer for future generations. The Wood Waste Calculator is available at http://naturespackaging.org/tools/carbon-calculators/. 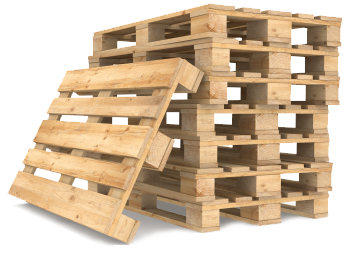 Manufacturers of wooden pallets as well as wood recyclers have a positive message to share with the world but seem to have been unable to relay this information in the way it deserves. Customers are unimpressed by claims from businesses that they are taking big steps in saving the world without being given any physical proof. With schemes like the Wood Waste Calculator now within reach, businesses in the industry can use the data to back up their message and help companies and communities to see the true benefits of using wood over other materials for commercial pallets.